Nightingale was born in Florence, Italy, on May 12, 1820, to a wealthy English family. She spent her youth in England and received from her father a thorough education in the classical disciplines: Greek, Latin, literature, history, philosophy, and mathematics. Her family expected her to marry, raise children, and entertain, but she had no interest in such activities. In 1837 she believed that she heard the voice of God telling her she had a mission, and for the next decade she pursued interests related to health, hoping to identify exactly what that mission should be. She trained to care for the sick at the Institution of Protestant Deaconesses in Karsersuerth, Germany, in 1850. 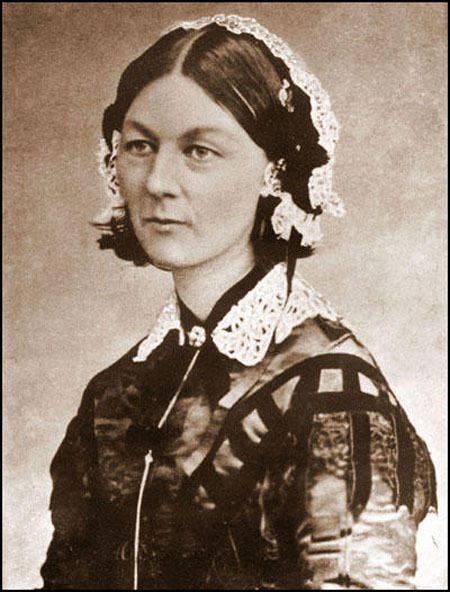 Nightingale was asked to take charge of the Harley Street Nursing Home in London in 1853. She revolutionized the institution by improving nursing care; the experience convinced her that the major problem confronting the medical community was insufficient training of nurses. The Crimean War, fought between Russia and British -­French­-Turkish forces, broke out in 1854 and diverted Nightingale from her concerns about nurse training. She traveled to Scutari, Turkey, to care for wounded British soldiers, who were living in a filthy, rat ­infested barrack hospital with grossly inadequate supplies. With funds she brought from England, Nightingale stocked the hospital with cleaning and medical equipment. She proved to be both a strong administrator and devoted to patients. Eventually she took charge of the whole hospital, implementing sanitary practices that reduced the death rate from 42% in 1854 to 2% in 1855. Nightingale become famous in London, and a grand reception was organized for her return at the end of the war in 1856. However, she arrived clandestinely and never again appeared in public. She continued to work for health care reform from her home. She completed a lengthy report in 1857, including statistics and diagrams to support her claims, describing the horrible living conditions of soldiers in times of both war and peace. She also wrote Notes on Matters Affecting the Health, Efficiency, and Hospital Administration of the British Army (1857) and Notes on Nursing (1859), giving basic instruction in modern nursing. In 1860 she established a nurse ­training school at St. Thomas Hospital in London. For the last 40 years of her life, Nightingale lived as an invalid, conducting all her business through correspondence and visitors. She died in London on August 13, 1910. Nightingale’s nursing and humanitarian work improved the lives of soldiers, and her innovations in medical administration established nursing as a profession. Nightingale’s influential report of 1857 prompted major reforms in military health care. Her statistical analyses were pioneering intellectual studies that complemented her practical strategies in sanitation and hospital care of military personnel. Nightingale’s achievements earned her celebrity status that enabled her to secure funds for continuing improvements of medical services. One outcome was her establishment in 1860 of the Army Medical School where physicians were trained to work under conditions of war. Nightingale’s work served as both the practical and inspirational origin for the field of nursing. Women all over the world wanted to emulate her and aspired to become nurses. During the Civil War in the United States, larger numbers of women entered nursing than ever before. As a result of Nightingale’s influence and authority, many medical institutions in Europe and North America opened nurse ­training branches, using the nursing school Nightingale established in London as a model. Nightingale firmly established nursing as a woman’s activity, offering a professional opportunity to many women who otherwise might not have worked outside the home.